In October 2011 at a Dallas auction house, John Wayne’s 1977 Drivers License sold for $90,000! We may not be the lucky owner of his driver's license, but we just acquired the next best thing. 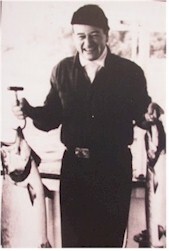 His 1968 Official SIGNED Fishing License, completely filled out in his hand and signed by him. 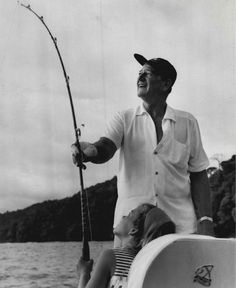 As many John Wayne fans know, next to making movies, John Wayne’s well known passion was fishing on his beloved boat "The Wild Goose". *See the 50 second video below of the Duke on "The Wild Goose". Its very moving and see if it doesn't give you Goose bumps (no pun intended) when his grandson steps up and puts his arm around his granddad! One of the most important John Wayne treasures we've ever acquired, this one of a kind Fishing License had such an intimate connection to Mr Wayne. Most likely hung on board the Wild Goose. And needless to say, you probably have a better chance of winning the ten million dollar lottery, than seeing one of these ever again.. An incredible find and sure to be a featured addition to any serious classic Hollywood or John Wayne Collection.